YUCCA VALLEY, CALIF. (AP) – Firefighters evacuated dozens of homes Wednesday as a wildfire raced across 26,000 acres of desert and destroyed 30 homes and buildings in an area where Gene Autry, Roy Rogers and other filmed Hollywood Westerns. 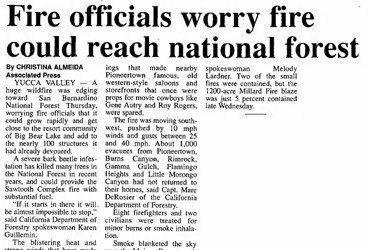 Historic buildings in the Old West movie set area of Pioneertown had been spared, but several other structures were destroyed, fire officials said Wednesday. Wind exceeding 40 mph fanned the flames, and officials said they didn’t expect the weather to change anytime soon. Dozens were evacuated Wednesday from communities in Little Morongo Canyon and Burns Canyon. As many as 1,000 people fled the flames Tuesday, authorities said. Firefighters had no estimate Wednesday of when they might have the blaze under control. “If we have more of the same with the high winds and high temperatures it could be trouble,” said California Department of Forestry Capt. Marc DeRosier. The blaze burned through historic Pioneertown, destroying at least 30 homes and some of the less-historic building there and in surrounding towns, said state Department of Forestry Capt. Marc DeRosier. Pioneertown, about two hours east of Los Angeles, was host to Roy Rogers, Russ “Lucky” Hayden and other Hollywood cowboys who helped establish the desert hideaway in 1946. 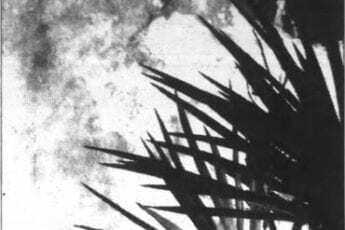 Gene Autry filmed “Last of the Pony Riders” and “Indian Territory” in Pioneertown. Hayden, who played the sidekick in the “Hopalong Cassidy” movies, used it for his “Judge Roy Bean” TV series, and “Cisco Kid” producers shot several movies and the TV series there. By the 1960s, the town had become more of a residential community, although filmmakers began returning a few years ago. Car companies have filmed commercials in Pioneertown in recent years. Music videos have also been made there. Investigators believe lightning started the fire during the weekend. 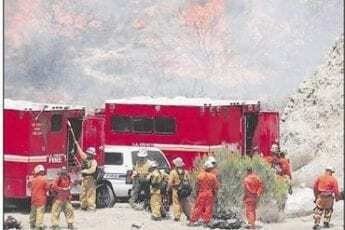 About 2,500 firefighters aided by 13 helicopters and eight air tankers were working the blaze. DeRosier and the force would be expanded. Elsewhere in the West, Montana firefighters were trying to control a blaze about 40 miles west of Billings that had destroyed at least four structures, including two homes, officials said. Authorities urged residents of about 120 homes to leave because of the 3,000-acre fires. No injuries were reported. Officials in Nevada said they had fully contained two wildfires burning toward the small town of Beatty, near Death Valley National Park.